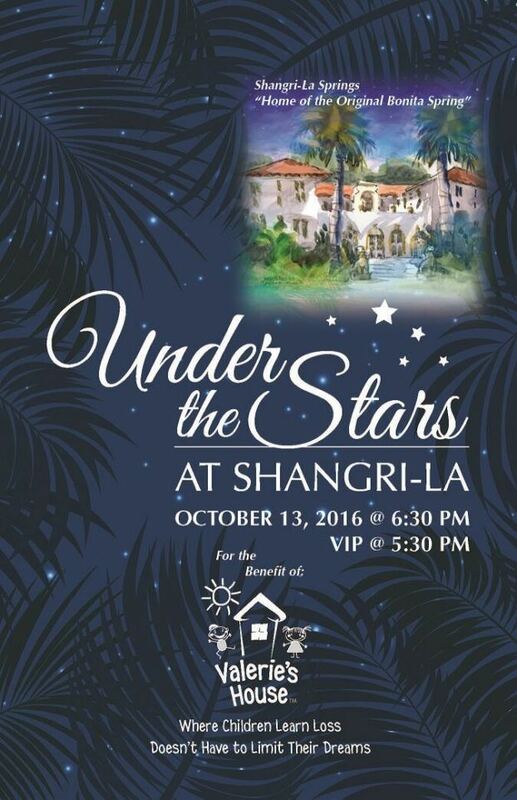 Join us for Under the Stars at Shangri-La! FORT MYERS, Fla. - Sept. 23, 2016 - PRLog -- Valerie's House, a Southwest Florida nonprofit devoted to providing support to grieving children, announces sponsors for its October 13 inaugural event entitled "Under the Stars at Shangri-La" to beheld Thursday, October 13 from 6 to 9 p.m. at the historic Shangri-La Springs Hotel at 27750 Old 41 Road, Bonita Springs, Florida 34135. Event sponsors include Cape Christian Fellowship Church, FineMark National Bank & Trust, HBK CPAs and Consultants, HBKS Wealth Advisors, Lee Health, Lee County Electric Cooperative (LCEC), LeeSar, Markham Norton Mosteller Wright & Company, U. S. Sugar Corporation, and the Wildcat Run Charitable Foundation. Sponsorships range from $2,500 to $10,000 and are still available at www.ValeriesHouseSWFL.org. Fire dancers, a calypso band with steel drum, and a live performance by a Valerie's House child singer/songwriter will provide entertainment for the island themed event. Silent auction packages to support the program include one-of-a-kind gold signature necklaces created just for Valerie's House, special art creations by Valerie's House children, and other packages. Tickets are available at $100 each, with tables of eight for $1,000. Valerie's House is a safe, comfortable place for children ages 4-19 and their adult caregivers to share, grieve and heal together after a death of a parent or sibling. Sessions begin with some free playtime and a potluck dinner, followed by age-appropriate arts, crafts and music activities to help them learn to talk about their grief, heal and bond with other children going through similar kinds of losses. Teenagers meet and often spend time discussing their feelings, their struggles, their healing, and how they are moving through school and life with the loss. "Children are losing parents and siblings in this community more than most people realize," Melvin said. "The expansion was very much needed into Cape Coral, where many of our children live and go to school." Founded by Angela Melvin, Valerie's House is named after her mother, Valerie Melvin, a 31-year old nurse and mother of two daughters who was killed in a car accident in 1987 as she drove to pick up her girls from summer camp. The first Valerie's House opened in Fort Myers in January 2016 and is currently serving 77 children. For more information, visit www.valerieshouseswfl.org/contact-us/, or email angela@valerieshouseswfl.org.